I’ve had another sudden fit of pseudo-artistic buffoonery. In February this year a new group emerged: the Galileo movement. Its scientific advisers are the who’s who of the international climate sceptics movement. Its patron is the powerful Sydney radio personality Alan Jones. The Galileo movement is aiming to kill the carbon tax, and it’s aiming to do this through attacking the science of climate change. 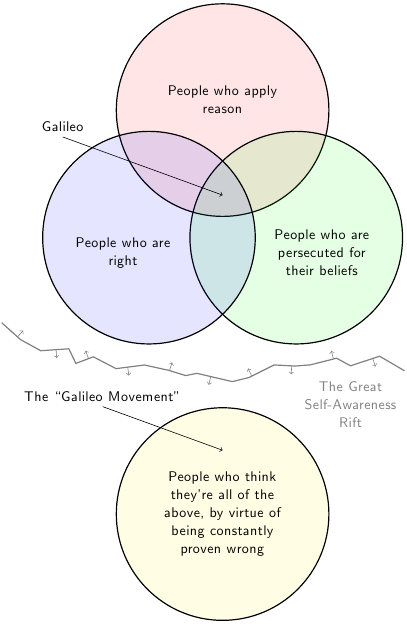 Galileo Gambit Venn Diagram by David Cooper is licensed under a Creative Commons Attribution 4.0 International License. The Galileo Movement’s co-founders are retirees Case Smit and John Smeed. Their business backgrounds are in science and engineering – science’s real-world application. Their experience is in environmental protection and ensuring air quality. At first they simply accepted politicians’ claims of global warming blamed on human production of carbon dioxide (CO2). When things didn’t add up, they each separately investigated. Stunned, they discovered what many people are now discovering: climate claims by some scientists and politicians contradict observed facts. Here’s another theory: Case Smit and John Smeed have never been involved in actual climate-related research at all, but through some intrepid Googling discovered that People On The Internet were having arguments. A stunning revelation indeed. Not having any particular notion of what real science is actually supposed to look like, they simply believed those people who appeared to be more outraged. Just as in Galileo’s time. Mobster arrested for callously exploding.